Aston Martin has been teasing an electric version of its Rapide four-door sports car for years. Now, Aston’s original partner on the project—the deeply troubled LeEco—has backed out, but the RapidE will still get a limited production run of 155 cars set for sale in 2019. The electric RapidE has been officially confirmed by Aston Martin for production following a revelation earlier today that LeEco, the Chinese company behind Faraday Future who was set to assist with engineering the RapidE alongside Aston, backed out of the project, according to Aston CEO Andy Palmer via Reuters. Aston Martin announced that 155 cars will be put into production set for 2019 and priced at $255,000, which is about $50,000 heavier than the current glorious V12 Rapide. 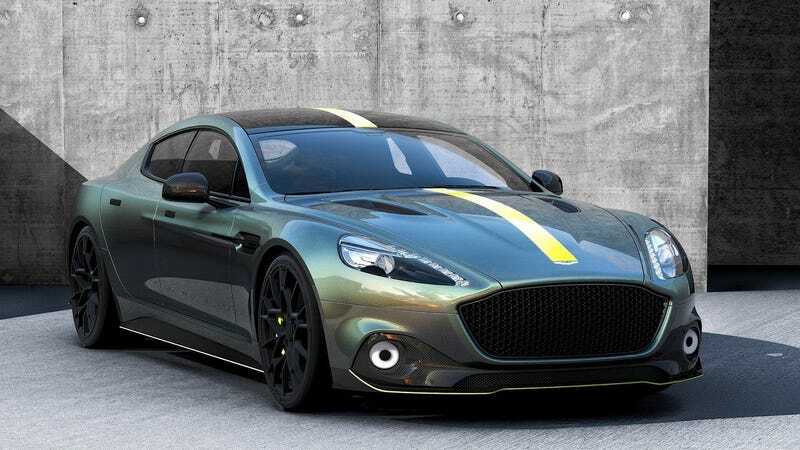 The design of the new RapidE, differentiated intentionally with the capital vowel, will be based on Aston’s recent Rapide AMR concept (shown above). Aston’s CEO was quoted to be targeting a 800-to-1,000 horsepower figure back in October of 2015, which is, ahem, commendable. You know, considering it doesn’t have a V12. It’s fine. There’s no word on how far the battery capacity will get you just yet. Let’s hope for at least one mile per $1,000. At least! With LeEco out, Aston has turned to Williams Advanced Engineering for all of the electrical engineering hard stuff. Williams worked on the original RapidE concept back in 2015, and currently supplies power guts to the Formula E racing series. Despite production being scaled back from initial projections due to LeEco’s departure, the RapidE will help Aston wade into full-scale electric vehicle production come time for the upcoming Aston Martin DBX crossover at the end of the decade. So, either look forward to that, or just be grateful that Aston Martin has engineered a completely new V12 for other, louder Astons to come. In the meantime, things still aren’t looking so good for LeEco and its affiliates. Am I the only one pronouncing it "Rapid-EEEE"?